If you are not using the chart and are taking the measurements directly from your child, you will need some of the same measurements that you used for the front pattern. Only this time you measure your child’s back instead of their chest. 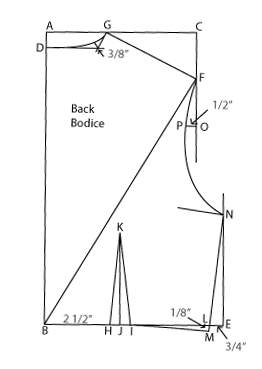 #4 – Center Length – Measure from the base of the neckline down the spine to the waist. #6 – Shoulder Slope – Measure from the outside tip of the shoulder diagonal to the center back of the waistline. #13 – Back Arc – Measure from under 1 armpit (armhole point from side length above) across the back to the same point under the other armpit. If you are not taking your own measurements, use this chart as your guide. 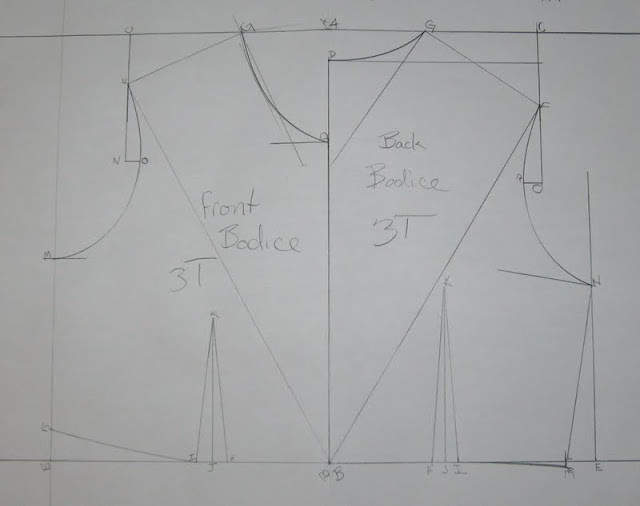 Step 23: With your french curve touching F, P, and N, draw the armhole curve. (The curve may align with the short line just before touching point N.
Then once you have everything cut out and cleaned up, your pattern should look like this. Make sure you label the front and back so you don’t accidently confuse them later. You might also want to write the size on each pattern too just in case you make multiple sizes one day. 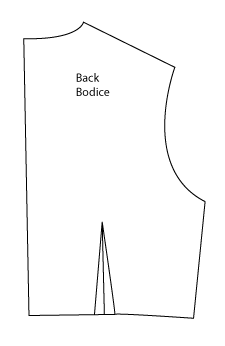 Go ahead and measure the side seams and shoulder seams from the back bodice with those of the front bodice. They should match up almost perfectly. Now all we need is to make a sleeve and you’re on your way to designing patterns for any outfit you’d like! Wow! Reading this is kind of overwhelming, but I'm thinking it's one of those things you just need to sit down and do & not analyze the process too much (does that make sense). It looks like you put a lot of work in this – I'm super impressed! THIS SERIES IS GREAT!! I wish I had discovered it before. Thank you! Thank you so much Toni. JUST LIKE JUNE MENTIONED A LOT OF BLOGGERS OR DESIGNERS ON NET KEEP HOARDING THESE BASIC KNOWLEDGE.